Amanda drew this map in kindergarten and saved it on her fridge for this day. This version of the US has about 10 states. That’s nice–it simplifies things. This is the first map to include Alaska, which is apparently an island in the Great Lakes. Hawaii is a floating plane over Mexico. I love the enhanced version of Missouri. The scale is amazing. St. Charles is directly south of Kansas City. I knew it was way out west, but I didn’t realize it was that far. I appreciate the Biddy shout-out. As for “pet Biddy” on the to-do list…considering I don’t actually know Amanda, that could be a little weird. Biddy does, however, run a petting zoo every day while I’m at work. You pet him, he pets you. It’s almost the weekend, so you know what that means…throw back a few beers and draw a map of the US by hand or on the computer. Send them to jamey.stegmaier@gmail.com. 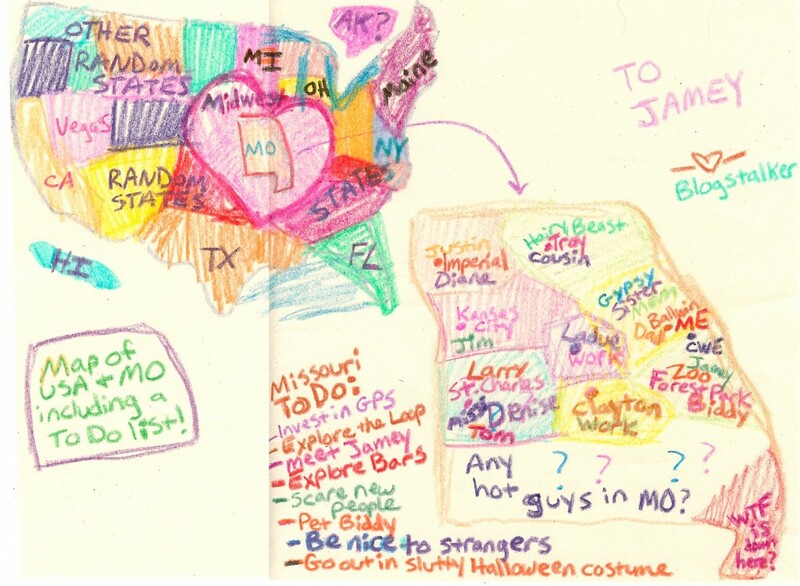 This entry was posted on Thursday, September 30th, 2010 at 10:43 pm	and is filed under best US maps, contests and tagged with best US maps. You can follow any responses to this entry through the RSS 2.0 feed. Psh, you totally know me. I was the thing in the forest you ran away from in 2004, surprise!